What is Pattern in Apparel Industry? Pattern is a hard paper which is made by following each individual component for a style of apparel or clothing. Pattern is one of the most important parts of apparel industry. In the past I have presented two important articles related with pattern which will be very useful for you. Working pattern or apparel pattern. Basic block or block pattern is an individual component of apparel without any design or style. It can be made into two ways such as modeling and flat method. Modeling is a primary and first method. Still it is widely used in apparel industry. 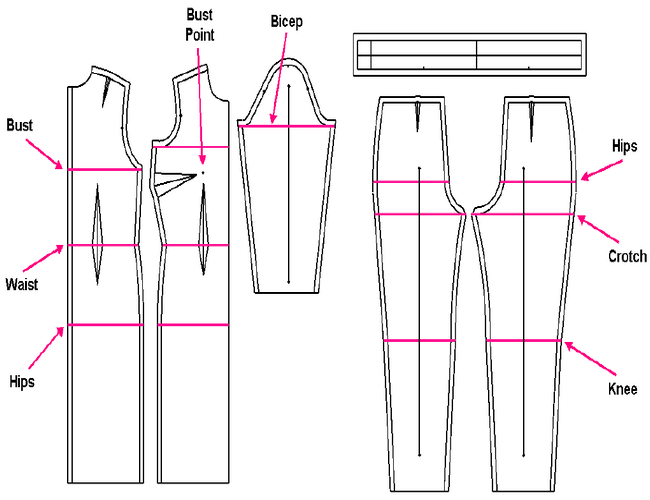 In modeling method, block is made with standard body measurement of dummy which is known as toile. Toile is worn on the body of dummy to check fittings. After that, toile is worn out from the body of dummy and individual parts of toile are drawn on board paper or hard paper. This method is most efficient but needs more time. In case of flat method, the pattern of different parts of apparel especially body and sleeve are made by technical drawing. Actually, this method comes from modeling method and by this method fast pattern making is possible. Apparel pattern is made on the basis of basic block or block pattern. Individual block pattern are drawn on board paper or hard paper. Different types of allowances i.e. trimmings allowance, sewing allowance, bottom line, center front line, pleat, drat is considered in this type of pattern. Planning Executive at Modele De Capital Ind. Ltd.
Category: Garments Production Tags: Method of Pattern Making, Pattern Making in Garment Industry, Pattern Making Technique in Apparel Industry, Types of pattern Making in Garment, What Do You Mean by Pattern in Garment?